Regiment/Catrawd: 2nd Battalion, Royal Welsh Fusiliers. Service Rank and Number / Rheng gwasanaeth a rhif: Private No. 39844. 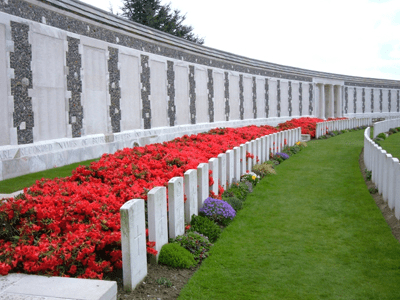 Military Cemetery/Memorial / Fynwent milwrol: Tyne Cot Memorial, West-Vlaanderen. Ref No Grave or Memorial / Rhif cyfeirnod bedd: Panel 63 to 65. Married to Matilda Jones and lived at 5 Ty Newydd Terrace, Rhyl, Flintshire. Photograph taken on Saturday 8 April 2017 by Geoffrey Mitchell of Panels 63 to 65 at Tyne Cot Memorial, Belgium showing the name of Private 39844 T Jones. Thomas Jones is also remembered on a Remembrance Plaque at The Royal Alexandra Hospital, Marine Drive, Rhyl, Flintshire and on The North Wales Heroes Memorial Arch, Deiniol Road, Bangor, North Wales.